Partnering with Liberty RV is like working with a trusted friend. If you’re searching for a new or used RV, travel trailer, fifth wheel or other pleasure vehicle, count on the most trusted name in the area for the biggest brands in the industry, like Sanibel, WindJammer, Bullet, Cherokee, and numerous others. You’ll get the best deal on the RV of your dreams when you go through Liberty RV. Not convinced? Visit your preferred online directory and type ‘Liberty RV’ into the search bar to see what others are saying about the company and its commitment to providing the absolute lowest prices on new and used RVs, like the new 2018 Forest River RV by Cherokee. You’ll save over $10,000 on this beautiful RV over the manufacturers recommended sales price. Check out online pictures of the 2018 Forest River or look at the floor plan by clicking on the listing. If you have a trade in model, you can expect to get the best value for it when you trade it in at Liberty RV Sales in Blue Springs. New 2017 models are still in stock as well, and are priced right to meet your budget. With financing over the Liberty RV website, you can spread out your loan over 15 or 20 years, to make owning a new RV much more affordable than you probably thought possible. Check out the 2017 Keystone RV Sprinter online to see its spacious front living room that includes a fireplace along with quadruple slides, making this fifth wheel unique in its class. Kitchen and dining area includes a roomy table and four chairs, overhead storage, cupboards, kitchen sink, ample counter space and numerous amenities you’ll have to see to believe. Make an offer on this RV or another from the inventory by calling 816-489-5232. 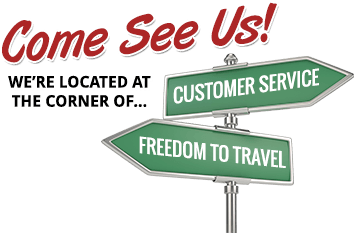 Liberty RV doesn’t just sell RVs- they are dedicated to providing the best experience for their customers by offering parts and service for used RVs as well. With more than 70 years of experience, service techs from Liberty RV are certified to work on any make or model travel vehicle. If your RV is sitting in your yard in non-running condition place a call to 816-489-5232 to speak with a technician who can restore it to full operation again and get you back out on the road. Locals trust Liberty RV Sales in Blue Springs for travel trailers, hybrid campers, folding campers, fifth wheels, toy haulers and other vehicles at the best prices available at the best terms. Get connected with Liberty over the phone or over the web and apply for financing that will make owning a new RV fit your budget seamlessly. Browse the massive online inventory from your living room and see why Liberty RV has grown to be a leader in RV sales in the Blue Springs and surrounding areas.